Karsten Interior was honored with two awards at the 2017 AGC Midyear Safety Meeting held this past June. The Safety Excellence Awards distinguishes construction companies that exemplify safety and leadership. 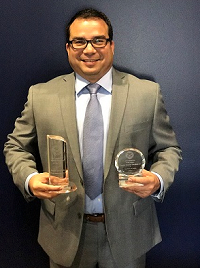 Voted by their peers, Karsten Interior received The Large Contractor of the Year Award and one of their own, Eddie Escamilla received the Safety Director of the Year/Ray Lambright Award. Eddie Escamilla’s leadership has enabled Karsten to complete 1.5 million man hours without a recordable incident in 2016. His commitment to educating and training his peers has been key to accomplishing this industry milestone for Karsten. Mr. Escamilla sits on safety committees within the AGC, ABC and ASA where he contributes with the implementation of safety standards throughout the industry. His involvement with these groups helped Karsten to be selected for the ABC/OSHA Cooperative Safety Program where partners meet monthly with OSHA personnel to discuss best practices, latest technologies and other ways to encourage a safe work environment. Congratulation Eddie! We are proud to call you a member of the Karsten Family.